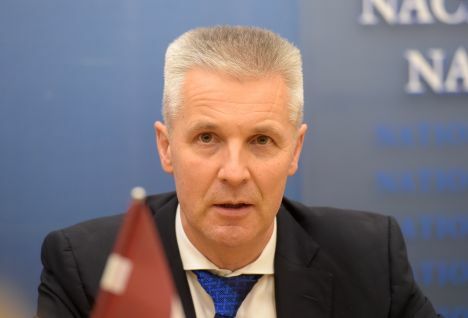 The issue of the deployment of the missiles of allied forces in Latvia is far from being relevant, «it’s dreaming», commented Latvian Defence Minister on Monday, February 11, in an interview with LTV’s news programme Rīta panorāma. The Defence Minister of Latvia, Artis Pabriks (Development/For! ), also noted that Russia’s decision to suspend its participation in the Intermediate-Range Nuclear Forces Treaty (INFT) does not increase the level of military threats to Latvia, «because we have long been within the reach of missiles of any distance». The minister added that the absence of the treaty could, however, bring more threats to other countries. In the near future, Pabriks predicted, the «propaganda apparatus of Russia» would talk about missiles to «work on underinformed minds in the Western society, by trying to intimidate them and saying that a new arms race would begin». The minister noted that the INFT has been violated by Russia for years, therefore it was no surprise that the neighbouring country and the U.S. decided to pull out of it. Pabriks believes that the upcoming negotiations on the issue would be difficult, since a number of countries, including Russia, do not want such treaties to exist, because the current situation leaves them free to militarise themselves.